Americans are watching more streaming online video than ever and the big winner continues to be Google-owned YouTube. 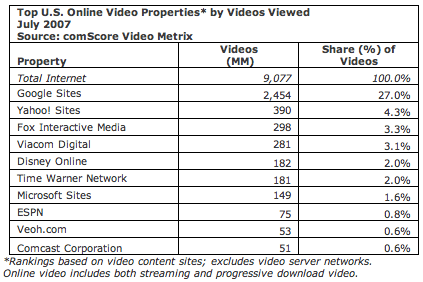 The comScore Video Metrix report for July 2007 — which looked at the usage of streaming video sites only — reveals that nearly 75 percent of U.S. Internet users watched videos online, up from 71.4 percent in March, and the average viewing time per-month was just under three hours. 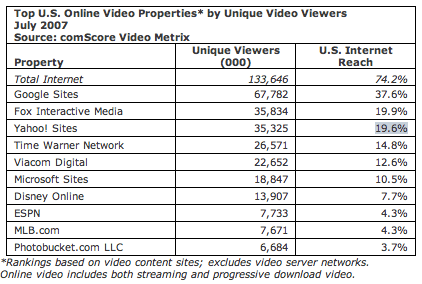 Google-owned video sites (which basically means YouTube) lead in terms of unique viewers, grabbing 37.6% of the market (67.8 million), with Fox Interactive in second place with 19.9% (35.8 million) and Yahoo! Sites a close third with 19.6% (35.3 million). YouTube’s dominance is equally evident when we look at the number of videos served: 2.4 billion video views compared to second place Yahoo with 390 million (4.3 percent), followed by Fox Interactive Media with 298 million (3.3 percent) and Viacom Digital with 281 million (3.1 percent). Two other interesting tidbits to come from the report: The average online video viewer consumed 68 videos, or more than two per day, and the average online video duration was 2.7 minutes — evidence that in terms of watching video in a web browser, short-form content is key. I have been involved with Streaming Media for 3 years now and I appreciate your post. It really solidifies that we are in the right place at the right time selling the right products and services. Do you know kyte.tv? I actually use it, and it seems to me that this might challenge the YouTube guys soon. It’s a web app with which every user can create his own TV show on the web or – and that’s the really cool thing – from his mobile. Shortform content is good because it lets you watch only what you’re interested–nothing else.